The Patriots signed sixth-round pick Nate Ebner to a four-year contract today. Ebner is listed as a safety, but he’s a true special teamer who won’t make an impact on defense for quite some time. Earlier this month, I caught up with Paul Haynes, who was Ebner’s positional coach at Ohio State. Haynes loved Ebner. Loved him. But Ebner only played three defensive snaps last year because Haynes said he still had to learn the mental aspect of the game. Haynes, who is now the defensive coordinator at Arkansas, had some great stuff to say about Ebner. During Ohio State’s football camps, Ebner earned a reputation of forcing his roommates to do an insane amount of pushups every night before bed. Eventually, Ebner’s intense work ethic earned him the nickname “Leonidas,” after Gerard Butler’s character in the movie 300. How many pushups would Ebner do? “Maybe 5,000,” Haynes said with a laugh. Haynes couldn’t overstate how much everyone loved him on the football team. How many times have you heard anyone say that about a special teamer? I have no idea if Ebner will make the team, but I can say with certainty that he’ll be a fun player to watch during training camp. Defensive end Chandler Jones (first round), linebacker Dont’a Hightower (first round) and defensive end Jake Bequette (third round) are the only Patriots draft picks who remain unsigned. The rookie contracts are merely a formality with the new salary scale, so there’s no reason to think they won’t get done on time. Sports hero Craig Krenzel is helping J D Equipment raise money for the Stefanie Spielman Fund for Breast Cancer Research. Krenzel was at J D Equipment on Northpointe Drive May 23rd to promote the sales of John Deere lawn mowers. A portion of each mower sold during 2012 will be donated to the Stefanie Spielman Fund. In 2011 they raised $26,000, this year they hope to raise more than $30,000. "All you have to do is come out and buy a tractor and you're going to really be helping in the long-term hopefully save a number of lives," said Krenzel. "I know the guys at J D jumped at the opportunity to be a part of the Buckeye Cruise for Cancer and to use their ability within the community and their equipment and portions of their proceeds to give directly to the Stefanie Spielman to continue to help fund these life-saving drugs and techniques and treatments," added Krenzel. Krenzel considers it an honor and a privilege to have known Stefanie and will continue to honor her memory as best he can. "I've been inspired by such an incredible person, to be a part of a cause that today has raised over $10 million for cancer research and the life-saving drugs and treatments it's been an honor and a blessing personally and I know that the folks at J D Equipment feel the same." Kirk Ferentz has been head coach for the Hawkeyes for 14 years now. That’s a long time and that’s a lot of great stories. Bob Sanders rings out. Robert Gallery isn’t bad, either. Certainly, Nate Kaeding, Colin Cole and Pat Angerer. I’m not going to go over them all (Abdul Hodge/Chad Greenway). There’s no way I’d mention all the ones that have moved you (Mitch King/Matt Kroul) through the years. I go back to Dallas Clark’s story, a lot. The 33-year-old signed what could well be his final NFL deal on Monday, linking up with the Tampa Bay Buccaneers. Here’s the story (didn’t call them “posts” back then and I’m not even sure this ever found its way to the internet) I wrote when Clark announced he was leaving Iowa early for the NFL draft (nine seasons with Indianapolis and had 427 career receptions for 4,887 yards, 46 touchdowns and a Super Bowl ring). IOWA CITY – Dallas Clark arrived at Iowa with a broken collarbone, a murky promise of a spot as a walk-on and darned near no money. He leaves as one of Iowa’s all-time best tight ends and, if he cleans up well for NFL scouts, a wealthy young man. Clark, everyone’s all-American this season, announced Wednesday he will skip his senior season and enter April’s NFL draft. Iowa went 2-for-3 in Hawkeyes shunning the NFL Wednesday. Iowa Coach Kirk Ferentz, who interviewed for the Jacksonville Jaguars opening last week, dropped out of the running and received a raise, UI Athletics Director Bob Bowlsby said. Offensive tackle Robert Gallery, who considered skipping his senior year next year, will remain a Hawkeye. Clark, a junior from Livermore, is the first Iowa player to skip a year of eligiblity since tight end Jonathan Hayes passed up the 1985 season for the draft. Clark, 23, said he’ll remain on campus this semester to train but won’t enroll in classes. He said he intends to finish his degree and pursue a teaching career. Clark kept himself composed and thanked Ferentz, strength coach Chris Doyle, tight ends coach Reese Morgan, Bowlsby and his family. Clark’s story is nothing short of incredible. He began his Iowa football life in 1998 as a part-time student with a broken collarbone. Former Iowa coach Hayden Fry promised Clark a chance to make the team and came through on the promise. “We’ve got to put Hayden in there, because it was Hayden who gave him a chance,” said Doug Clark, Dallas’ dad. Clark became a full-time student and a full-fledged team member in January ’99. But two days before the season opener against Nebraska – Ferentz’s first game as head coach – Clark had an emergency appendectomy. The first two semesters in ’98 were particularly difficult. His mom, Jan, died two days before he graduated from Twin Rivers High School. With two sons finishing college, Doug Clark had a tough time helping his youngest son make ends meet. Dallas Clark basically lived on his own that first year. “It was really hard,” said Clark, who has some $15,000 in student loans. “I just didn’t feel like a college freshman, because I had so many responsibilities. Before being awarded a full scholarship in fall ’01, Clark played football, took classes and worked. He held a summer job with UI grounds services, which included mowing Kinnick Stadium. He mowed Kinnick, then he owned Kinnick. The deadline for underclassmen to file for draft eligibility was Wednesday at 5 p.m. Players then get 72-hour window to reconsider. Clark is definitely going. Gallery is definitely staying. Gallery, a 6-foot-7, 305-pounder, would have been a mid-round selection this year. Clark said his age was a factor. He’ll be 24 in June. Next year would have been his sixth year at Iowa. ESPN’s Mel Kiper rated Clark as the No. 3 junior tight end in the nation. Late first-round picks get contracts in the $5 million to $7 million range with signing bonuses of about $1.5 million. Third-rounders get contracts in the $2 million range with signing bonuses of about $700,000. “I think Dallas is going to be a guy they can split out, use as a slot receiver, a lot like the Giants use (Jeremy) Shockey,” said Marv Cook, a former all-American tight end at Iowa who had a Pro Bowl career in the NFL. 1998 – Red-shirted after joining the team as a walk-on. 1999 – Did not see any game action. Missed second half of season with an injury. 2000 – Earned coaches appreciation award for special teams play. Saw action on special teams and at linebacker in all 12 games. 2001 – Made switch to tight end, starting 10 games and playing in all 12. Earned honorable mention all-Big Ten by coaches and media. Had two TD catches against Miami (Ohio) and had seven receptions for 116 yards against Penn State. 2002 – Winner of John Mackey Award as nation’s top tight end. First team all-American by Associated Press, Walter Camp Foundation, American Football Coaches Association and Football Writers Association of America. First team all-Big Ten. Big Ten offensive player of the week after Purdue game when he caught three passes for 116 yards and two touchdowns (a 95-yarder and the game-winner in the closing seconds). As he and his North Carolina State teammates ran out of the tunnel to play Central Florida to open the 2007 season, Markus Kuhn looked around Carter-Finley Stadium and was overwhelmed. For the 21-year-old freshman, it was more than his collegiate debut; it was the first college football game he ever attended. Five years later, the German-born Kuhn was the Giants’ seventh-round selection in last month’s NFL Draft after a senior season in which he tallied five sacks at defensive tackle. The 6-4, 302-pounder became just the second German-trained player — after Patriots offensive lineman Sebastian Vollmer in 2009 — to become an NFL Draft pick. Kuhn is 26, ancient by NFL rookie standards, but he’s raw and known as a “gym rat,” as general manager Jerry Reese noted. He had experience playing for a club team in Germany before coming to the United States, but he arrived in Raleigh, N.C., without complete understanding of the basics that become second nature for most American players by the time they play in college. Kuhn’s unlikely road to the NFL began when he first visited the United States for a family vacation to Florida when he was 14. During the brief stay, he watched football on television, marveling at the intensity and popularity of the sport. Kuhn had tried other sports in Germany, but he desired the physicality he eventually found in football. When he turned 15, he joined the Weinheim Longhorns’ junior team and played quarterback and linebacker. 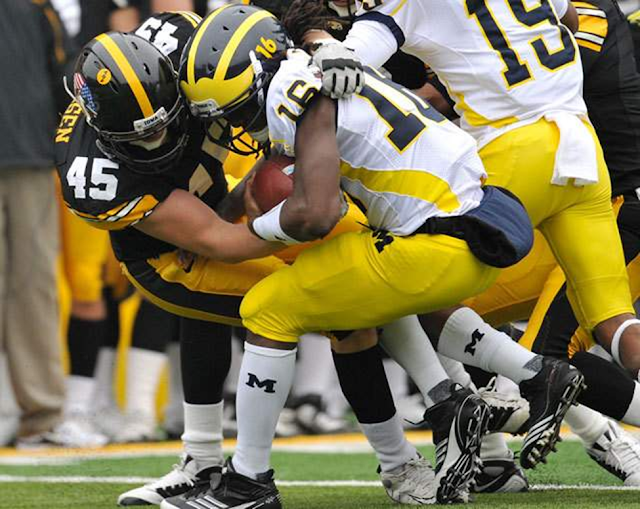 He joined the club’s senior team four years later, settling in at linebacker and leading the second-division team to a championship and a spot in the country’s first division in his final season. 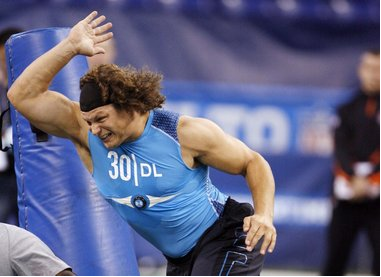 Before long, NFL Europe invited Kuhn to camps across the country. When he was invited to the league’s two-week player development camp in Tampa, Fla., he was convinced that he had a future in the sport. But if he attended the camp, he would forgo his college eligibility. Instead, Kuhn took the college route. Kuhn prepared himself academically by taking the appropriate standardized tests. He and his father mapped out their recruiting stops. The two landed in Washington, with highlight DVDs in hand, and Kuhn began selling himself to colleges on the East Coast unannounced — he had sent e-mail messages to various schools before visiting, but none responded. “They probably saw it was some German e-mail and thought it was spam or someone trying to sell them something so they didn’t really make it anywhere,” he quipped. The trip began at Liberty; Richmond was next. Kuhn visited a few more Football Championship Subdivision programs and, realizing how impressed coaches were, he set his sights on Football Bowl Subdivision schools. Eventually, they stopped by North Carolina State. During the next five years — he redshirted in 2009 due a shoulder injury — Kuhn steadily improved. He began his career at defensive end, but after his sophomore season he made the transition inside to tackle and became a starter his senior year. Off the field, his heavy German accent faded and he became entrenched in American culture, taking up hobbies like hunting, which Cole introduced him to and is rare in Germany because of strict firearms laws. While his assimilation to America continues, another transition begins to a new level of American football. He’ll do it under the microscope back home. A German reporter was on hand during last Saturday’s rookie minicamp sessions even though Kuhn was held out with a leg injury. And though American football pales in comparison to soccer and other sports in Germany, Kuhn said if there’s one team Germans recognize it’s the Giants. His professional career is off to a delayed start due to the leg injury, a laceration that required stitches, but Kuhn is confident he’ll able to help a loaded Giants defensive line soon enough. And just like in college, he hopes the first NFL game he attends will be with him on the field. When Urban Meyer took over the Ohio State football team, he gave Mike Vrabel a challenge if he wanted to stay on staff. The former OSU defensive lineman passed with flying colors, and the result is that Vrabel is a rising star in the coaching ranks. 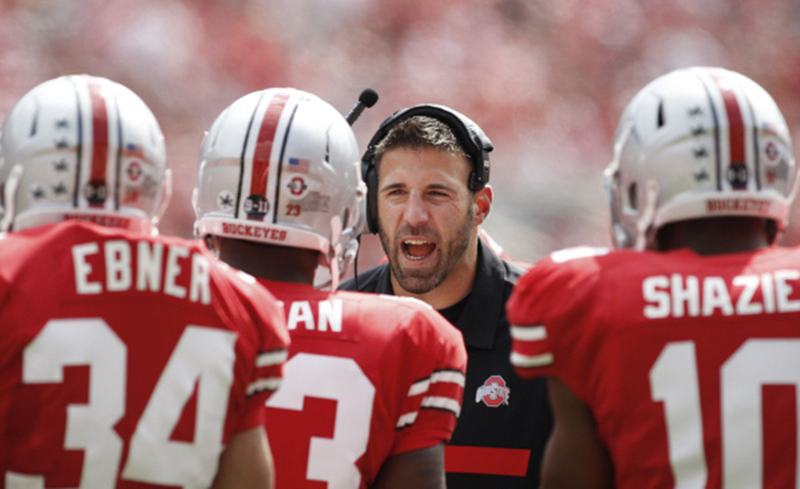 When Urban Meyer was putting together his staff that would attack the job of restoring Ohio State into a national championship contender, there was one question that was hard to answer – and it involved Mike Vrabel. Meyer always was a fan of the three-time Super Bowl champion and Ohio State legend, who was hired by friend Luke Fickell to coach OSU’s linebackers in his stead during the 2011 season. On the other hand, Vrabel accepted the gig to join Fickell’s staff as a coaching greenhorn fresh off a 14-year career as an NFL stalwart. 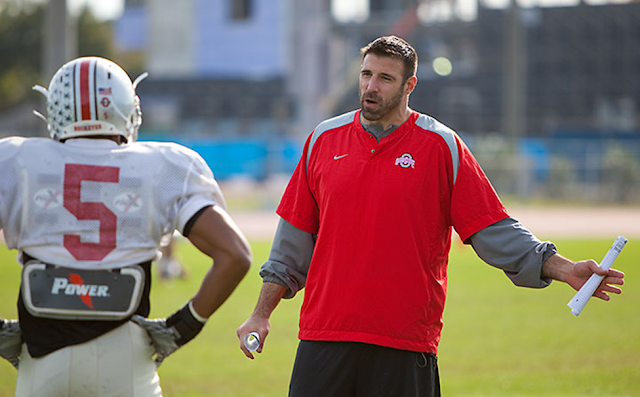 When he joined the Ohio State staff, Vrabel had never known what it means to be a full-time coach – and that includes the recruiting realm. “When I talked to him about keeping him on the Ohio State staff, I said it’s very simple,” Meyer told fans at his spring kickoff luncheon in April. “We are at the end of the day going to be judged by the talent level and how good you are at bringing quality student-athletes to Ohio State. That attitude basically sums up Vrabel, who worked himself into a highly recruited prospect at Walsh Jesuit High School in northeast Ohio and then one of the greatest defensive players in Ohio State history. To this day, the man who made No. 94 famous in scarlet and gray holds the school record for season tackles for loss (26), career TFL (66) and career sacks (36). Now in his second act as a Buckeye, he’s returning in 2012 to the position at which he excelled in his playing days, having moved to defensive line coach with Fickell sliding back into the linebackers coach role he previously held. Through the spring, Vrabel said he was happy with taking over as the coach at his old position. The early returns were positive from a player standpoint as well. It also helps that Vrabel fits in with the mold Meyer is trying to instill at Ohio State when it comes to the phrase “competitive excellence.” Vrabel is no wallflower; in fact, he oozes intensity both on and off the gridiron, which is what Meyer is looking for. There’s a method to the madness, though. No one accumulates such lofty school records and then goes on to the pro ranks and has such success without knowing the tricks of the trade, and Vrabel spent the spring trying to impart those to his charges. “We're going to play physical and we're going to play square and we're going to play with violent hands,” he said. “If we do those three things, we'll be graded positively. If we're able to go from point A to point B as fast as we can and compete and find a way to compete for the length of a play, which we talk about as four-to-six seconds around here, we're going to have a good D-line. He also boasts a “healthy respect for the game,” as Meyer put it, something the head coach noticed during Vrabel’s playing days. Meyer is confidants with Bill Belichick and often visited the New England head coach when Vrabel suited up for the Patriots. The head coach wants to see his coaches get better each day along with the players, and that’s challenge Vrabel seems excited to live up to. “Coach Meyer has obviously provided some leadership and direction,” Vrabel said. “He's worked his way up from GA here, so he's going to continue to challenge each one of the coaches on his staff to get better. With Vrabel becoming more and more comfortable in the Woody Hayes Athletic Center, his talents there and on the recruiting trail are combining to make him one of the rising stars of the profession. Of course, the coach would say the latter skills were easy to develop given the product he gets to sell when he’s out on the road. “I think it's just being honest,” he said. “It's easy to sell Ohio State. It's not a very hard sell job. So it's our players, it's the people that are here. It's easy for me because I experienced it. That's not a real tough sell job. It's not like I'm trying to sell ketchup popsicles to a woman in white gloves. It's pretty easy. 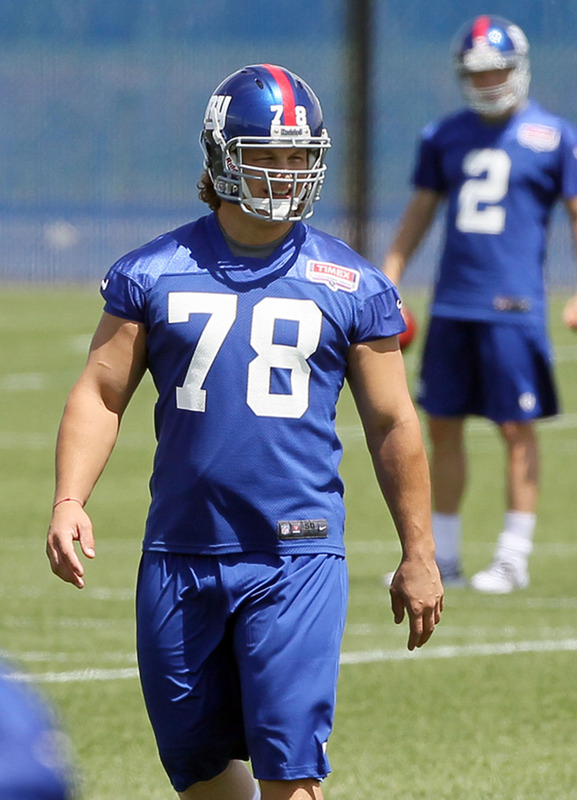 It’s clear as soon as Markus Kuhn opens his mouth (think Arnold Schwarzenegger) he is no ordinary newcomer at the Giants’ rookie camp this weekend. Just the second native of Germany ever to be drafted by the NFL, the hulking defensive tackle is trying to be just the second German native to stick in the NFL after the Giants made him a seventh-round pick last month. Kuhn is trying to follow in the footsteps of Patriots offensive tackle Sebastian Vollmer, a native of Dusseldorf and second-round pick in 2009 who faced the Giants in the Super Bowl last season. Though Kuhn’s bid to make it in American pro football is an unlikely one (he is 26 and has never seen an NFL game in person), it wouldn’t be the first time his quest has been described that way. “It was only six years ago that my father and I were traveling the East Coast with a DVD highlight tape, asking small colleges like Liberty University if they wanted to give me a chance,” the 6-foot-4, 303-pound Kuhn said Friday after the first day of the rookie mini-camp at the Meadowlands. Vollmer hadn’t emerged by the time Kuhn and his father went on their American scholarship quest, so they didn’t know quite what to expect. When Liberty and the other small schools showed immediate interest in Kuhn, who already was 21 at the time, his father told him to step back and aim higher. It was a smart move, because Kuhn quickly landed with North Carolina State and didn’t need long to show he belonged in a foreign game. He started the first game of his college career in 2007, was named a freshman All-American by the Sporting News. After battling injuries that forced him to redshirt the 2009 season, Kuhn came back strong and was an anchor for the Wolfpack last year with 4½ sacks and 10 tackles for lost yardage. Not bad for someone who didn’t take up the sport until he was 15 (Kuhn said he was too bulky for soccer and liked football from watching the NFL on television) and who occasionally had to play quarterback for his club team because it didn’t have enough players. The Giants don’t lack for defensive linemen, but general manager Jerry Reese always has been a believer in the “best available player” philosophy and sees Kuhn as a project worth the gamble. Though Vollmer is the natural comparison, Kuhn has another prominent — much more prominent — German sports transplant in mind when he dreams about how his NFL career will unfold. For those who have checked out the YouTube video showcasing his rugby prowess, there’s no escape. Admit it. Nate Ebner had you at hello. If anyone wondered why Bill Belichick would surrender a sixth-round pick on an Ohio State walk-on, a kid who registered a mere three snaps at safety, but was more known for his work on special teams, it’s right there in living color. He jumps off the screen. Take after take. He has a speed gear no one can touch. He gets to ball carriers like a heat-seeking missile. He has great open field skills. Now, granted, it’s a rugby video. It’s not football, but there’s enough evidence to connect the dots. The Buckeyes did, and weren’t sorry. Just ask Paul Haynes, the former co-defensive coordinator at Ohio State who coached Ebner on the kickoff unit. So by the look of it, Ebner is going to be this mad kamikaze-like figure on special teams if he makes the Pats. That’s fine. But can he play safety? He was drafted as a defensive back. Is that even in the realm? Free safety? Strong safety? In space? In the box? Where might we find young Ebner? Ebner endured through personal tragedy. In 2008, his father was killed at his auto-salvage business during a robbery attempt. “He took it to motivate him. It was like it was a drive for him,” Haynes said. “He was so close to his dad. They always worked out together. That’s one thing he loves to do. He loves to work out. He took it and it motivated him to become even better. Many people suspect former Patriots [team stats] linebacker Mike Vrabel, an assistant coach at Ohio State, may have made sure Belichick wouldn’t overlook Ebner, who practically willed OSU to a bowl game. With rookie camp beginning today comes the first live look at the former rugby star who had people scratching their heads when drafted. Now, our curiosity is piqued. Is it ever. University of Iowa retired wrestling coach and Olympic gold medalist Dan Gable once said, "Once you've wrestled, everything else in life is easy." Perhaps the Tennessee Titans have that quote hanging in their war room, as they have targeted football players with grappling experience. Their second and third-round draft picks both have wrestled. Zach Brown went undefeated as a heavyweight in his senior year of high school. Mike Martin won a state championship in Michigan his junior year of high school, and only gave up wrestling because of his football scholarship. Karl Klug, who has seven sacks for Tennessee as a rookie in 2011, qualified for the Minnesota state tournament as a wrestler. "It's something that to me, when a guy has been a wrestler, especially when he has been a successful wrestler, it says something about his toughness and his commitment," general manager Ruston Webster said. When teams draft both offensive and defensive linemen with a wrestling background, they get the toughness and commitment Webster mentioned, as well as an understanding of leverage, handfighting and balance that is hard to teach. Particularly in the heavier weights, wrestling matches are a battle of leverage that also require top conditioning. The Titans aren't the only team to realize the strength wrestlers bring to football. 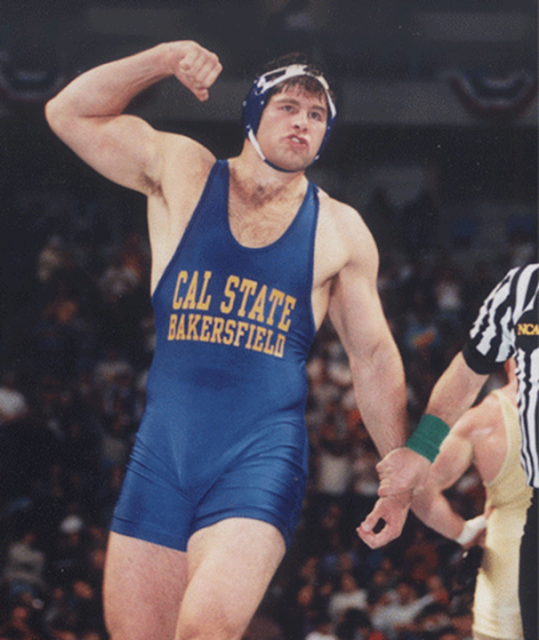 Stephen Neal won two NCAA Division I wrestling championships -- one by beating eventual WWE star and UFC champion Brock Lesnar -- and a world championship before joining the New England Patriots for nine seasons. He didn't play football at Cal St.-Bakersfield. His wrestling prowess was enough to warrant an invite to camp. Antonio Garay played football and wrestled at Boston College, winning All-American honors his sophomore year. Now playing for the San Diego Chargers, he had 8.5 sacks in his past two seasons. Martin and Brown will soon start their first NFL minicamp with the Titans, but if Gable's words hold true, it will be easy for them. After all, they're wrestlers. When the Patriots used a sixth-round draft pick on Ohio State's Nate Ebner -- he of the 23 tackles in three college seasons -- eyebrows arched. But the high regard given Bill Belichick's football acumen (grudgingly in some circles) ensured that while eyebrows moved, tongues didn't wag. Belichick gets the benefit of the doubt. Belichick noted when he took Ebner that this wasn't a lark. He had OSU references, most prominently Mike Vrabel. The former Patriot joined the Buckeyes coaching staff last year and he gave a stamp of approval to Ebner, a former rugby player. Whether Ebner turns into an every-down safety or is used almost exclusively on special teams will be borne out in the next few years. But Vrabel says there's a chance Ebner will flourish in the NFL. "He’s got the ability to run at a high rate of speed and move and bend without slowing down," said Vrabel. "He can run through traffic without losing speed. Guys that cover kicks and maintain their speed in traffic are what you're looking for." Vrabel sees Ebner's rugby background as a plus. "Whether you play rugby or wrestle as in Stephen Neal's case, you develop good balance, good body control. When you are a national caliber athlete in a sport, chances are there will be carryover." The immersion of Ebner will begin Friday when rookie minicamp opens providing the first glimpse into what Ebner can become. COLUMBUS, Ohio — It’s amazing what we forget, even when we think we remember. I was reminded of that very fact on Wednesday, when a poster by the name of ‘UDBuck’ linked a highlight video of former Ohio State wide receiver Ted Ginn Jr. on our Ozone Forum message board. Everyone remembers Ginn as one of the most electrifying players in the country when he was wearing No. 7 for the Buckeyes from 2004-06. I can vividly remember Ginn striding down the sideline at Ohio Stadium past the horrified Michigan players on the sideline, all of whom were helpless to stop him from reaching the end zone during Ohio State’s 2004 upset in Columbus. It’s not hard to recall his three-touchdown performance against Michigan State earlier that season, or his incredible performances against Oklahoma State and Notre Dame in Ohio State’s bowl games. We remember Teddy Ginn as a great Ohio State football player. What we forget is just how unbelievably fast he really was once he got the ball in his hands. No seriously, forget what you think you remember. Just watch the video. That video got me thinking out loud. 1. A poster on our message board joked that the only reason there wasn’t an accurate 40 time for Ginn was because no one could ever catch him to put him at the starting blocks. 2. That is some clever hyperbole, but it’s hard to imagine there were many players in OSU history who could run faster than Ginn, on or off the football field. 3. Let us not forget that Ginn was a state and national champion hurdler at Glenville. He was originally being recruited by then-OSU track coach Russ Rogers, who believed the speedster could qualify for the 2008 Olympics. 4. Ginn put his track career on hold to focus on football at Ohio State, and it didn’t take him long to become one of the most dangerous return men in all of college football. He averaged 25.6 yards per return as a freshman, leading the nation and setting an Ohio State single-season record in that department. 5. The speedster burst on to the national scene at Michigan State, when he scored three touchdowns, tallying scores on a 17-yard reverse and a 58-yard reception in addition to his 60-yard punt return. 6. He eventually set a Big Ten record for most career punt return touchdowns with six, including four in one season. That mark set a school and Big Ten single-season record and at the time tied the NCAA record. 7. The last time we saw Ginn in an OSU uniform, he was racing down the sideline against Urban Meyer’s Gators for a 93-yard kick return. It turned out to be the last play he would ever make for the Buckeyes. 1. Ginn finished his Ohio State career with over 4,000 yards of total offense and 26 touchdowns, but it is scary to think what type of numbers he might have put up in Meyer’s offense. 2. The Buckeyes probably did a better job of using Ginn in different/creative ways than they did with any other player during the Jim Tressel era in Columbus. 3. It’s almost difficult to understand where that 2006 offense came from, based on some of the other offenses we saw during Tressel’s tenure at Ohio State. 4. The play they ran for Ginn against Notre Dame at the 6-minute mark of that video was something right out of the Urban Meyer playbook. 5. We have actually seen them run that exact play this spring, with Braxton Miller pitching the ball to Philly Brown on the reverse. 6. Philly is a good athlete, but no one else finishes that play the way Ginn did. At first, it looked like he was going to be tackled in the backfield. 7. He turned the corner got into the open field and ran past Doug Datish, who was hightailing down the left sideline. When he got to the 20-yard line, it looked like there was a wall of defenders between Ginn and the end zone. Instead, he stepped inside and then back outside, which rendered both defenders in his path useless. 8. It wasn’t just his incredible burst that made Ginn so dangerous. He had tremendous vision, uncanny change of direction, and that extra indefinable quality that made him one of the most elusive college players ever. 9. This sparked a Twitter conversation, which led someone to ask me how Ginn compared to former Florida star Percy Harvin. Both players obviously have elite, top-end speed and great vision. 10. They may have been two of the best ever when it comes to pulling away from defenders at the end of a long run or return. Ginn differed from Harvin with his ability to change direction and reverse field without slowing down enough to be tackled. 11. Most of Harvin’s long runs came from finding “seam” in the defense. He hit the hole about as hard as any player in the country, and one he got going, it was hard to bring him down. 12. Harvin was a more physical player, who could run through arm tackles and bounce off defensive backs. He was perfectly suited for Meyer’s offense. Ginn never much cared for contact, but it’s fun to think how deadly Ginn would have been in that system of misdirection. 13. He might have won the Heisman Trophy. No joke. For as good as he was at Ohio State, his statistics were never gaudy. He didn’t have exceptional hands, and was never a great route runner, but neither was Harvin. They simply found other ways to get him the ball. 12. Ginn’s best season was 2006, when he caught 59 passes for 781 yards and nine touchdowns. He also had 266 yards and another score on the ground for a total of 1,047 yards and 10 touchdowns. 13. Harvin’s best season at Florida was 2008, when he caught 40 passes for 644 yards and seven touchdowns. He also had 659 yards and 10 scores on the ground, for a total of 1,303 yards and 17 touchdowns. 14. The previous year, Harvin tallied 1,623 yards and 10 touchdowns. He averaged nearly 10 yards per carry for his career at Florida. Scary to think what Ginn might have been capable of in a similar role. Labels: NC Sports Athletes in the News, ted ginn jr.
Kirk Ferentz's deal "as favorable for a coach as any"
From Marc Morehouse's article "On Iowa Daily Briefing 5.3.12 — Bowlsby and the Big 12"
Bob Bowlsby to Big 12 commissioner makes sense. (It’s not a done deal, at least not yet.) Let’s roll his resume. Bowlsby served as Iowa’s AD from 1991 through 2006, where he hired Kirk Ferentz and Steve Alford (not all that glitters is gold) and spearheaded the major renovation project at Kinnick Stadium (nearly $90 mill), among other endeavors. He left for Stanford in 2006, seeking a new challenge. The Bowlsby-Bob Stoops thingie has reached mythical proportions. Who knows what happened. My theory is, yes, Stoops was interested in coming back to coach his alma mater. Maybe the search committee soured him. I don’t know that. Then, Oklahoma got heavily involved and that made a lot of sense, both with the tradition and the financials. The Tom Davis thingie remains a clear misstep. I don’t remember anyone — ANYONE — standing up and saying that Alford was a bad idea. It clearly didn’t work. Not all that glitters is gold. Sometimes, you go the hard road to figure that out. Bowlsby also worked as a national leader on various NCAA committees that required an enormous commitment. Most notably, he served as chairman of the NCAA wrestling committee and also spent five years on the NCAA men’s basketball committee, including two years as chairman in 2003-04 and 2004-05. Bowlsby takes control of the situation, no matter what it might be. The Big 12 situation is nutty, to say the least. Bowlsby’s football acumen is unquestioned. Jim Harbaugh, two BCS bowls at Stanford. Kirk Ferentz, Kinnick renovation, ’02 and ’04 Big Ten titles. Nutty Big 12, meet a football AD. Bowlsby wouldn’t be Texas AD DeLoss Dodds caddie. Texas will swing a mighty big stick. Will the league allow itself to be hostage to the Burnt Orange’s TV whims? I don’t think that would sit well with Bowlsby. Remember that it took nearly two years before Ferentz signed his first contract with Iowa. That was super agent Neil Cornrich vs. Bowlsby. The cover was “separation language,” but who knows what it really was. That was the first time Iowa administration dealt with a real sports agent. Since, Ferentz’s deal has become as favorable for a coach as any. A happy coach is a coach who goes into his 14th season at the same school. The Big 12 also contains Oklahoma, the Texas nemesis with a lot to say. It also welcomes TCU and West Virginia this season. It needs a strong hand. That’s Bowlsby. The Big 12 is a gold mine of interesting football. Maybe a centralized network would help unlock that? TV would be job 1 for Bowlsby. No. 2 would be giving the league an air of stability. But here we are nearly 11:30 a.m. Thursday with an offer on the table. The Big 12 needs Bowlsby more than he needs it. Former Iowa linebacker Tyler Nielsen has been named a member of the National Football Foundation and College Hall of Fame's 2012 Hampshire Honor Society, according to a release. Eligible players must have been a starter or played a significant role in their final year of eligibility, and they must have achieved a cumulative 3.2 GPA over the course of their undergraduate careers, the release said. The list of 721 players features 232 schools and athletes from all levels of college football, from the Football Bowl Subdivision to the National Association of Intercollegiate Athletics. The National Football Foundation will select the top 16 individuals from that pool of 721 to receive an $18,000 postgraduate scholarship; the best of the 16 gets an additional $7,000 for his scholarship and a trophy. Nielsen finished his senior season with 73 tackles — including 4 for a loss and a sack — to go along with a forced fumble and two recoveries. He started all 13 games Iowa played, splitting time between the outside and middle linebacker spots. The Humboldt native struggled with injuries over the course of his Hawkeye career, although he played through them in 2011. He reportedly didn't struggle at all in the classroom, though; he was named to four-consecutive academic All-Big Ten teams. Nielsen signed with the Minnesota Vikings as an undrafted free agent over the weekend. FOXBOROUGH, Mass. — Bill Belichick gets criticized by some for not providing enough entertainment value in his daily press conferences during the season, but the coach's creative juices flourish each year when draft time rolls around. No one makes the NFL draft more fun than the New England Patriots' coach. No one is more unpredictable. No one is willing to take as many gambles in as many different ways. Belichick did it again Saturday, on the last day of the three-day draft, with several more unexpected moves, topped by one of his most improbable choices yet. First, he made another trade, his fourth of the weekend, to give his team more selections. Then, he used one of the choices, a sixth-rounder and the 197th overall, to take a rugby player. He drafted Nate Ebner even though Ebner has been on a football field for a play from scrimmage for exactly three plays in his high school and college life. Ebner was the shock not only of the day, but of the entire draft. He grew up in Dublin, Ohio, in Ohio State country. He played some PeeWee football, but switched early on to rugby because his late father, Jeff, had played rugby. He took part in age-group events and excelled, to the point of being named MVP in age-group world championships in 2007 and 2008. He was hoping to become a professional rugby player. In 2009, he decided to walk on the Buckeye football team. The 6-foot, 205-pounder is listed as a safety, but only played that position for three plays in his entire career (and had a sack on one of those plays). His niche was special teams. "I enjoy running down as fast as you can, man. It's exciting. It's crazy, such a rush," he said. "It's just one big blur, then it's over. I don't know, maybe I've got a screw loose." Playing on special teams, he feels, is similar to some of the things he does in rugby. "It comes from the fact that we hit each other, there's a lot of running and some big dudes," he said. Belichick said he did not watch any rugby tapes of Ebner. It was seeing what he did on special teams that led his team to the decision to draft him. "We think he has a lot of good football in front of him," Belichick said. "Of course, we had good connections at Ohio State. Obviously, that played a part in it." 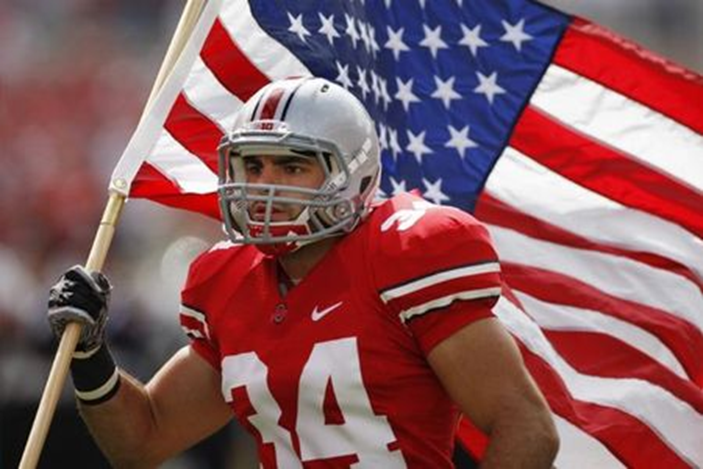 Ebner ended up leading Ohio State in special teams tackles and was given a scholarship for his senior year. The "connections" Belichick spoke about referred to one of his coaches this past season, former Patriots star Mike Vrabel. "I can't say enough about him," Ebner said. "I learned so much from him ... What an amazing guy. I can't thank him enough for the help he has given me ... He made it clear to me. He said, 'With the things you do here at Ohio State, you can play for years in the NFL doing that.'" When NFL scouts went to the Ohio State campus for that school's Pro Day this spring, Ebner was allowed to work out for them. He turned heads with an impressive performance. He was timed at 4.48 in the 40 and had strong numbers in agility drills. Afterwards, he had meetings with several teams, including the Patriots. It gave him hope that he might get drafted, or at least get a chance to sign as a free agent with an NFL team. "I didn't want to expect anything. I didn't want to get overly excited," he said. When the Patriots called Saturday to tell him they were drafting him, he had trouble comprehending with it. "Words can't describe how excited I am to be part of this organization," he said. As if his story was not enough on its own, it became more complicated four years ago when his father, who owned an auto business, was beaten to death in a robbery. The killer has been convicted and sent to prison. "Obviously it was devastating," Ebner said. "Nobody wants to lose their father, especially the way that happened. The type of person he was and our relationship, I could only draw strength from it. "I never really was one, like I've said to people, to pity myself. I don't know how he would feel about me feeling bad for myself because he was gone. He was one to say every day, 'If I die tomorrow, I wouldn't be mad about it, the way I lived.' So I don't want to, as his son, be sad about it," he added. "I just tried to draw strength from it. I'm so lucky to have a person like that in my life, especially as a father figure. He was amazing." FOXBORO — If you are trying to make some sense of sixth-round pick Nate Ebner of Ohio State, who was a walk-on for the Buckeyes, and whose claim to fame is rugby and special teams, look no further than former Patriots great Mike Vrabel. The latter is an assistant coach with Ohio State, and was instrumental in helping Ebner make the transition from rugby to football. It’s not outlandish to think Vrabel may have been a go-between with the Pats. At the very least, he helped Ebner have a great pro day. Ebner said Vrabel really stressed the importance of special teams play, and how it could be a ticket to the pros.